Our consumption of cookies and cocktails goes up this time of year. The holiday season just inspires us to munch and sip. So this week, we’ve collected some past recipes – for cookies and cocktails, of course – that we think you’ll find seasonally appropriate. We’re ready for a holiday break, too, so this will be our last post of the year. But these recipes should warm the hearth until we see you again in 2017. Cherry Winks. 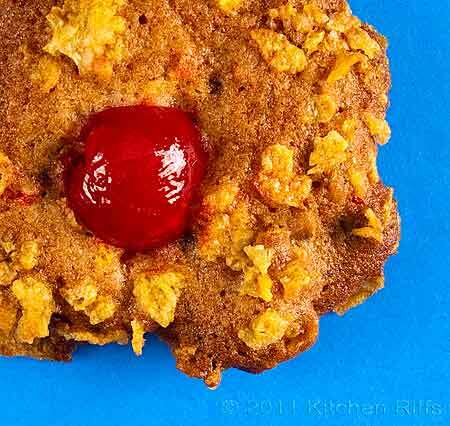 These cornflake-fueled goodies are a blast from the 50s. Pfeffernüsse Cookies. 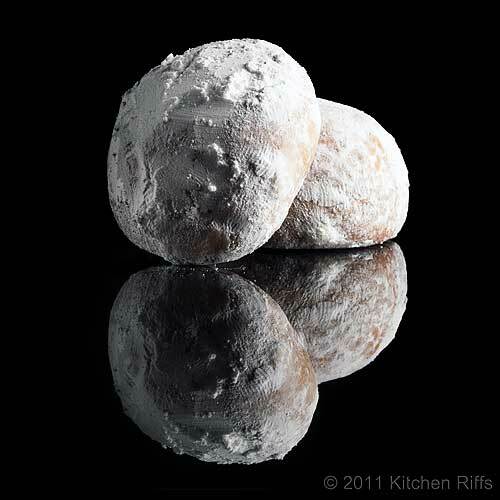 A German cookie, their name can be translated as “pepper nuts.” This is a family recipe that dates back to the 19th century. Pfeffernüsse are good when freshly made, but even better after they age a couple of weeks. Coconut Kisses (Macaroons). Easier to make than traditional macaroons. Kids (of all ages) love these. Anise Drop Cookies. When I was growing up, my mother always baked at least a dozen varieties of cookies at Christmastime, and this was a regular. Crunch Drop Cookies. These are made with Rice Krispies® and quick-cooking oats. So they’re appropriate for breakfast, yes? Thumbprint Cookies. AKA Thimble Cookies. Fill these with your favorite jellies and jams. Best way we know to enjoy peanut butter and jelly. Peanut Butter Cookies. A classic that everyone seems to love. Double Orange Dark Chocolate Cookies. Chocolate and orange pair perfectly. And oranges are in season right now – just in time for making this cookie. Best Chocolate Drop Cookie Ever. A recipe from my great-grandmother. And it really is the best. Chocolate Pepper Cookies. Black pepper in cookies? Yup. Kids like these; grownups love them. Almond Sugar Cookies. Because you can’t celebrate the December holidays without baking sugar cookies. Lemon-Almond Glazed Cookies. Delicious. And fun to decorate with sprinkles or decorating/sanding sugar. Chocolate Almond Sesame Bars. Another one for almond lovers. Sesame seeds kick the flavor up a notch. Wedding Cookies. AKA Russian Tea Cakes. Addictive no matter what you call them. Rum-Frosted Pecan Shortbread Cookies. The name says it all. Santa will love these. Christmas Stollen. OK, not a cookie. But homemade stollen is perfect for breakfast on Christmas morning. Frostbite Cocktail. A great tequila-based drink. Hints of chocolate add holiday cheer. Brandy Alexander Cocktail. Another chocolate lover’s delight. Milk Punch Cocktail. What Santa really wants you to leave out for him. Eggnog. A winter classic. Make this now and let it age a bit for Christmas. Or New Year’s Eve. Grasshopper Cocktail. Great green color, and tastes like an after-dinner chocolate mint. Stinger Cocktail. Crème de menthe puts the tingle in this 1920s society favorite. Classic Champagne Cocktail. Because bubbly. Need we say more? Kir Royale Cocktail. Because more bubbly. A colorful, festive-looking drink. French 75 Cocktail. Still more bubbly! Plus, the gin and lemon pack some firepower. White Russian Cocktail. Like liquid ice cream. Smith and Curran Cocktail. Tastes like a boozy chocolate egg cream. Cranberry Shrub Cocktail with Bourbon. Gorgeous and tasty. 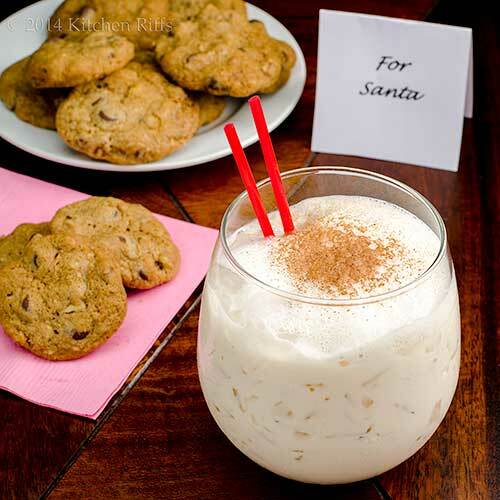 Plus, you can make a kid-friendly version of this holiday drink. We truly appreciate everyone who drops by and reads our blog. Thank you. We wish each of you a wonderful holiday season. See you next year. Santa will be very happy visiting you, John. So many goodness, I love esp. those Pfeffernüsse. Great cookies, love that Cherry Winks. I'm all done with cookies, made close to 700, now I can enjoy them! And the Grasshopper, the perfect delicious colorful cocktail for the season! Way to go, John and thanks for all the past recipes! Hi Angie, Pfeffernüsse are great, aren't they? Such a tasty cookie. :-) Thanks for the comment. Hi Pam, 700 cookies is a lot! 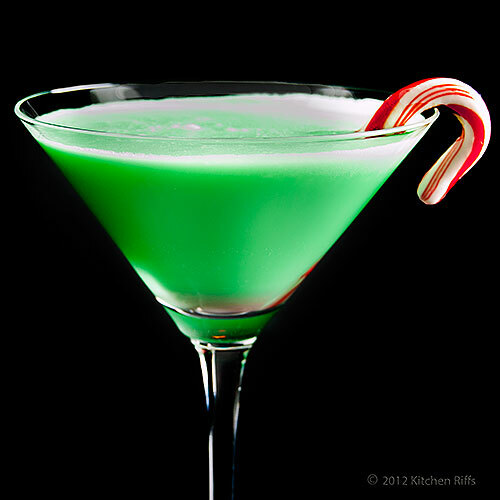 The Grasshopper is a wonderful holiday drink, isn't it? Looks -- and tastes! -- just perfect for the season. Thanks for the comment. Your list of cookies and drinks makes me hungry and thirsty for more It's time to have some fun. It's breakfast time for me and I am nibbling on some Stollen that my German girlfriend gave me. Yummy ! Happy Holidays to you and your family. Hi Gerlinde, Stollen is such good stuff, isn't it? Love its flavor! Thanks for the comment, and Happy Holidays! Munch and sip - such a great idea! Love that grasshopper - so pretty and all the treats sound delicious! Have a very Merry Christmas and look forward to hearing from you next year! Hi Tricia, 'tis the season for munching and sipping. :-) Thanks for the comment, and Merry Christmas. And Happy New Year's! Have a great Christmas with lots of green and red cocktails! Hi Mae, we will, we will. :-) Thanks for the comment, and Happy Holidays! So many great cookie recipes! And yes, stollen is the perfect Christmas breakfast. You've certainly given us wonderful choices for last minute Christmas baking. I hope the two of you enjoy your break, Merry Christmas and all the best in the coming New Year. Nice to see a summary of all the goodies you've posted this past year- reminds me that I need to try making your Grasshopper cocktail- it looks so refreshing! Happy holidays and I look forward to your return soon. Hi Sashi, and we have about twice as many cookies that we haven't posted. We need to get busy. :-) Thanks for the comment. HI Laura, we just LOVE stollen! So nice. :-) Thanks for the comment. Hi Karen, holiday baking is so much fun, isn't it? Thanks for the comment and holiday greetings, and Merry Christmas! Hi Fran, the grasshopper is a fun drink! It's been some time since we've had one -- need to enjoy one this season. Thanks for the comment and Happy Holidays! What a delicious round-up John! You got me really curious with the Pfeffernüsse Cookies! And I will take a look at the coctail list for inspiration. A big Happy Holidays to you and the Misses! Hi Evelyne, Pfeffernüsse are really worth making! This recipe is better than any store bought one I've ever had. Thanks for the comment, and Happy Holidays! That's a massive list of holiday treats and drinks! It'll probably take some time for me to digest all that sweets you shared. Thanks for sharing John and wish you a happy holiday season! Hi Yi, we wanted to post this well before Christmas so you'd have time to make them all. :D Thanks for the comment, and Happy Holidays! This is a great post with a whole lotta Christmas goodies in one spot. Good stuff. I went to a 50's party last year and they had Grasshopper cocktails, it was kinda like a liquid boiled lolly with a bang, still not sure if I liked it, but it sure does look pretty here. It is the season to indulge and your round-up is impressive! My mom made Pfeffernüsse too. It's a great holiday cookie! Happy Holidays John! Hi Anna, I like the Grasshopper as a dessert drink. It IS rather like a liquid lolly! Thanks for the comment. Hi Marta, thanks, and Happy Holidays! Hi Deb, Pfeffernüsse are SO good, aren't they? Thanks for the comment, and Happy Holidays! Hi Liz, always good to sip and munch at this time of the year, isn't it? Although we'll regret it in January! Thanks for the comment, and Happy Holidays! Hi Lydia, those are a really good cookie! Pretty, too. Thanks for the comment, and hope you have a wonderful holiday season! Well why not ! Of course we must have cookies and cocktails. Who needs to eat little dainty food on a tooth pick anyways when you can pick up a cookie with your hands and balance it on the side of your cocktail glass. It is the new hip Tapas! Great round up! Wishing you and Mrs. Riffs a safe and happy holiday season. See you in the New Year! Awesome round-up John...Merry Christmas and Happy New Year to you and all your loved ones...see you in 2017! I'm bookmarking all of these--I haven't heard of half of them, but they look wonderful! Happy holidays to you and the Mrs., John! this is the proper way to celebrate such a festive time of the year. Happy Holidays to you! Hi Bobbi, definitely the new hip tapas! :D Thanks for the comment, and Happy Holidays! Hi Juliana, thanks, and Happy Holidays! Hi Ala, a lot of good cookies for you to try! Thanks for the comment, and Happy Holidays! Hi Denise, lot of fun choices. :-) Thanks for the comment, and Happy Holidays! Hi Agness, OK, you can give up "some" sweets, but not all sweets. :D Thanks for the comment. Oh wow! I love this Christmas Round Up. So many delicious things to try. Hi Peachy, so many to try, and only so many days in the month! A good problem to have. :-) Thanks for the comment. Jeez John. I thought I was done with my baking but now I see I have so much more to go. Perhaps I should just start on the drinking! Have a great holiday. All my best to you and Mrs. Riffs! Wow, that's an impressive collection of both cookies and cocktails. Look like you'll be having a sweet Christmas, John. Hi Abbe, we always find that drinking and baking go together. :D Thanks for the comment, and Happy Holidays! Hi Frank, sweet indeed! Thanks for the comment, and I hope you have a terrific holiday season! Wow, you've got so many fabulous recipes for both treats and drinks, John. Definitely time to enjoy both. Happy holidays to you and the Mrs! Hi Robyn, we love making and enjoying cookies and cocktails at this time of the year! Always look forward to this. :-) Thanks for the comment, and Happy Holidays! Great collection! Merry Christmas, John! Oh man, I want to eat ALL the cookies! ALL of them! Hi Pam, three are some goodies here! :-) Thanks for the comment, and Merry Christmas and Happy New Year! Hi GiGi, don't we all? And when I was a kid, I tried! :-) Thanks for the comment. Cookies and Cocktails!! How can you go wrong there? :) Hum...a grasshopper with wedding cookies. YUM! Have a wonderful holiday John and see you next year! Hi MJ, a grasshopper with wedding cookies sounds like a terrific combo! Thanks for the comment, and Happy Holidays! Happy Holidays to you too, John! Hi Nisha, fat tastes good! Particularly if you use butter in your chocolate chip cookies, which we always do. Lots of it. :-) Thanks for the comment, and Happy Holidays! Happy Holidays John and Mrs. Riffs! great send off for the holidays, love the cookies and the drinks! Hi Cheri, we're having cookies and cocktails tonight! :-) Thanks for the comment, and Happy Holidays! I'll take one of each! (cocktail and cookie!) Hey, it is the season to indulge, right? Happy holidays! Hi Carolyn, we're having cookies and cocktails tonight! :-) Thanks for the comment, and Happy Holidays! Uh...you read my mind! I was just about to scour your site to find a Christmas cocktail, and you did all the prep for me. Thanks! I can't wait to start going through your christmas cookie links. Cherry Winks! I had completely forgotten about those, and I love them. By the way, that's hands-down the most dramatic photo of mexican wedding cakes i've ever seen; it's beautiful. :) happy holidays to you and Mrs.KR! Hi Jeff, happy to oblige! :D Thanks for the comment. Hi Shannon, cherry winks are a blast from the past, aren't they? Really good cookie. :-) Thanks for the comment, and Happy Holidays! Hi Raymund, loads of good cookies. And we're trying to eat them all! :D Thanks for the comment. A festive collection, I like all of those cookies and I need lots of time to try them all :). Happy holidays to you too John. Hi Amira, you definitely need to try them all. Although not all at one time! :-) Way too many for that. Thanks for the comment, and Happy Holidays! I've already made the Pfeffernüsse cookies and Nicholas is making the Christmas Stollen when he comes home this week. Your cookie list is a family treasure. Thank you for posting the entire yummy list! Hi Amalia, a bit early for a drink, isn't it? Cookies anytime, however! Thanks for the comment. Hi Taruna, we do know some good cookie recipes! hanks for the comment. Hi Dani, we have more recipes we really need to put up. We haven't made stollen this year -- should probably do that. Thanks for the comment, and Happy Holidays! There are the makings of a great Christmas party here! I read over the eggnog recipe and you've solved a mystery there for me—why eggnog doesn't go bad, and in fact can "age" without spoiling the eggs. Of course, it's the spirits... I guess I should have known. Anyway, you've inspired me to go out and make a batch today! Hi Frank, it's interesting how/why eggnog doesn't go bad, isn't it? And that's a good recipe! :-) Thanks for the comment. And Happy Holidays! Gosh, who would need anything else but this list for the holidays? Who needs ham and turkey??? Hi Maureen, yup, cookies and cocktails are enough for us! :-) Thanks for the comment, and Happy Holidays! Great round up! Plenty of things to try! I would have a great Christmas time with all these cocktails! Happy Christmas and Joy in your hearts! Hi Caroline, we like having lots of choices! Thanks for the comment. Hi Katerina, those are a lot of cocktails! And cookies. :-) Thanks for the comment, and Happy Holidays! I thought I was done baking cookies and then those pfeffernusse cookies and chocolate-orange cookies (love that combo) called out to me. The Brandy Alexander cocktail is a blast from my past. Such a fun round-up. Happy holidays and all the best in 2017. Hi Claudia, those cookies are both worth making! Really good. :-) Thanks for the comment, and Happy Holidays! Hi John and Mrs. K.R. Merry Christmas and a very Happy, Safe and Healthy New Year to you both!!! You sure have served up some delicious sounding cookies and cocktails John. I'd take any one or all at any given time. Thank you so much for sharing such a delightful spread. I'm glad we are connected on Facebook. I plan on trying to learn how to use it better in the future. In the meantime, I can keep up with your yummy posts! Thanks again John. Great cookie and cocktail recipes. Wishing a wonderful Holiday Season. See you in 2017! Hi Louise, sorry you're going to stop blogging, but your reasons make SO much sense! And really glad we've met. Virtually speaking. :-) Thanks for the comment and Merry Christmas. And Happy New Year's! Hi Dawn, thanks for the comment, and Happy Holidays! Hope you had a Merry Christmas too! Great roundup, and looking forward to more posts in 2017. Hi Beth, we had a great Christmas. And are looking forward to a Happy New Year's. :-) Thanks for the comment. Two great lists! Hope you're having a wonderful holiday season. Hi Lisa, a lot of good eats and drinks! :-) We're having a wonderful holiday -- hope you are, too. Thanks for the comment. Hi Julie, loads of nice choices, don't you think? :-) Thanks for the comment. Yummmm. A good excuse to indulge is the holidays. Hi Lux, Happy 2017! Thanks for the comment. Hi Kristi, the White Russian is wonderful, isn't it? Such a fun drink! Sorry to hear you won't be blogging for awhile, but you certainly have good reason! Thanks for the comment, and Happy New Year!